Teika the lion, Gekka the jellyfish, Yuuka the oni, Ginka the cross-dressing mafia son, and Hyouka the bioweapon--along with their parents Ouka and Kyouka (the ruler of a demon underworld)--all live under one roof in a family frenzy. There seems to be a lack of reviews of Kyouran Kazoku Nikki where all the episodes have been watched at the time of writing so I shall attempt to fill that void. The Diary of a Crazed Family, that should tell you something about this anime. In fact, if you were any bit serious about it, it would take your face to the curb and beat it out of you. At least for the most part. But let's get this party started shall we? There is no real story in Kyouran Kazoku Nikki, each episode could easily function as a standalone short, but that doesn't mean the show lacks continuity or has no real meat within the episodes themselves. Usually there is an Aesop or moral or something or other to be taught by Kyouka-sama and that's about the only thing that would annoy me. It's more or less a slice of life. Your mileage may vary. The art, fitting to the theme, is vibrant and colourful. In fact, this is one of the few anime that does not have over-the-top &quot;anime&quot; hairstyled characters. For that I applaud it. Heck, even a Stinger is faithfully recreated in anime form and ofcourse, the sparkles are appropriately added so there really isn't anything to say about it. Not outstanding, but not terrible. The same can be said of the sound. The OP, is one of the few that I willingly sit through to listen to. A very good indicator of what the show is about as well. There are multiple EDs, one for each of the Midarezakis, save perhaps Gekka, but she's a Jellyfish sooo. Moving on, each ED is in a way, representative of each Miderazaki, quite fitting and credit is given where credit is due. Next we have the BGM, which I can't say doesn't go terribly well nor wrong. In fact, not commenting about it probably the best thing I could do. Because it means they did something right. I have nothing to complain about. Almost all of the main cast has some depth to them, a shame really, I wanted to know more about Ouka and Ginka. In fact, there are still some unexplained flashbacks (and I haven't checked Wikipedia yet) for Ouka and I would like that resolved, thank you very much. Ginka, on the other hand, got the short-stick when they drew the characterisation priority chart I bet. Other than that I'm fine with the hyperactive yet insecure Kyouka, the shy and timid Yuuka, the mysterious Gekka, the innocent Hyouka, the mindful Teika and of course the rather normal Chika (rather being the stressed word). Then of course, comes the enjoyment derived. But it is hard not to enjoy such a well implemented comedy. My favourite moment is probably when Santa took a Stinger and later going to town with Kyouka. There are plenty of things that are over the top. But that just adds to the comedy, and somehow it never feels forced. Which usually then segues into a heartwarming moment. Quite well pulled off at points but sometimes, I can already see it coming which can dampen the impact somewhat. Overall, this is something of a must watch for fans of comedy (personally I don't know anyone who would dislike a good comedy). That's it really, so embrace Goddere and may Kyouka-sama smile upon you. What do you get when you take a Jellyfish, an oni, a lion, a cyborg, a cross dressing mafia member and a cat with a serious God complex? You get one of the strangest comedy anime of all time. For such a long time whilst watching this show I couldn't pinpoint what exactly it was trying to achieve nor what it wanted to be. It constantly jumped between comedy and random shenanigans to tragic backstories and drama at the drop of a hat, all of which made the show incredibly jarring and confusing to watch, resulting in some of the worst tonal shifts I have seen for any anime. Now, before I actually get into that, let me talk more about the plot for this show. Enka, the God of destruction died one thousand years ago but upon dying, proclaimed that one of his children will carry on his will to destroy the world. Now, in modern Japan, all of the possible children of Enka have been gathered together and are joined as a family in an attempt to prevent the destruction of the Earth by showing them how wonderful and beautiful human life is. The possible children of the God Enka, include Teika the lion, Gekka the Jellyfish and even a biological weapon, Hyouka. Each of the main characters are both unique in terms of design and personalities, and have decent chemistry with each other, as well as lengthy backstories and tragic past. And that's it for narrative really. Nothing really happens of much significance and all the events that do happen in the show feel random and intrusive rather than a natural progression from arc to arc. While the show does attempt to create comedy, and for the most part, the comedy could make me smile and even laugh a couple of times, it's ultimately ruined by the abrupt and strange tonal shifts that change so frequently, which ruins the dramatic tensions of the show. One moment they're throwing out some random gag and the immediate next one we are watching the backstories of a young girl who is being whipped by her evil family. It feels jarring; clunky. Some of the most entertaining episodes of the show are just when they are sticking to comedy and random hijinks and if the show was more like this in its entirety I would've had a lot more fun as a result. It's just that they chuck so much in with so many random characters that it begins to feel tiresome and the show begins to drag mid-way through. While, as I said, the characters can have decent chemistry with each other, their backstories are forced in and are so boring that I lose interest right away. Even when the show does introduce a more central and focused narrative for the final four or so episodes, it still feels rather awkward and confusing as well since the characters keep jumping from one place to the next without reason and characters are introduced which go nowhere. The show as a whole is just rather inconsistent with no rhyme or reason to any of the events that are happening. And it's not like the show is completely devoid of any interesting ideas or themes, it's just that the ideas are executed so poorly or never expanded enough on to feel worthwhile in the end. Most notably, when one of the arcs focuses on the mistreatment of animals and how they should be the ones to control society and not humans, but not enough time is spent on fleshing it out enough. The characters themselves could provide a joke here and there that made me smile but that was the most I ever got out of them. Kyouka, the cat with a serious God complex is both selfish and annoying and easily my least favorite thing about the show. While they do try and present her as being full of insecurities, justifying her behaviour, not nearly enough time was spent on fleshing it out nor developing it. Ouka, the father of this jumbled family, was rather plain and flat and hardly memorable in the slightest. The other characters of the family are a little more interesting in terms of personality but their backstories felt trite and forced, used as a cheap way to make us sympathise and connect with the character rather than building them up as people. There are a plethora of other characters but they're so forgettable, that's it hardly worth the time speaking about them. The animation was fairly consistent but there are not really all too many moments of great art or movement. The art style works in the shows favour and conveys the goofy and silly nature of the show rather well, in the same vein as Konasuba does with its animation and art. I liked most of the soundtrack for the show, albeit it, if it is pretty forgettable but the opening is catchy as hell. Story: The show wasnt as random as I thought it would be. It keeps on switching between drama and comedy, which is very confusing. There are way too many serious parts, and too few funny parts. If you liked the randomness of the first episode, and want to watch something similar, dont bother watching the rest. With the cast of characters, I feel that the show could have been done a lot better. Art: The art is awesome, no com...plaints there. Sound: I think that having different ending songs each sang by a different member of the family is a good idea for their part. The OP is also very catchy and perfect for the show. Character: While they included a very weird returning cast: an electric butterfly, a biological weapon, a talking lion, a floating jellyfish, and a shinigami, they failed to make them funny. Most of the characters just get a few seconds screen time each episode, with no real impact on the story. They also failed to show the story of the homo son, Ouka and Kyouka. Even though Ouka and Kyouka are the 2 characters who came out the most, you know almost nothing about them in the end. The shinigami, who I thought was one of the more enjoyable characters only came out in 1-2 episodes as a major character as well. None of the characters are interesting nor memorable. Enjoyment: to be frank, I didnt find this anime funny at all. There is no conversational humor like in Minami-ke or Lucky Star, very few randomness like in excel saga, no circumstantial humor, nor any other type of humor at all. Sure, there is a lot of absurdity, but they failed to make them funny. The few jokes and lines they have, are already overused in the first 1/4 of the series. In the end, this show is more like a normal anime story with a weird cast (who still act like normal characters anyway). It had a potential to be a great anime, but fail to deliver. Overall: If you have time, and nothing else to watch, go ahead. I like the OP the most about the anime. I recommend the following episodes: 1, 8-10, 21. This was a very odd comedy to me. It had a plot but it was hidden amongst some of the random adventures that didn't advance the plot but made for a pretty good episode and laugh. 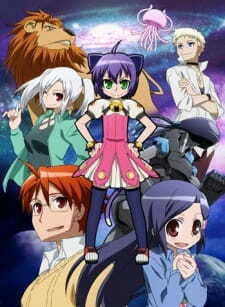 To me this was an ok anime for it had lots of comedy that made me laugh but at the same time it had some comedy in it that was band and didn't really hit the funny bone unless you had the mind 2 year old. Then there are the times when it gets all serious then they try to pull something funny out but you are already in serious mode and you can't laugh but you knew it was funny. The Romance in this anime was kinda hidden but there was a feeling it was there. I would say this was more of an adventure genre than a romance since there just was not that much romance in it. Characters in this anime kept things interesting since they were all different in their own respect. They all had different back grounds but all of them did have one overlapping tone to their past. In the end the plot all pulls together and things start to make sense a bit more. If you have enough time, I would say watch this anime since it does hold some good value in my books.